It’s hard to find a geek these days that didn’t play with Legos when they were growing up, or for that matter still playing with them today! Also for those of us around in the 80s, chances are you loved Ghostbusters. 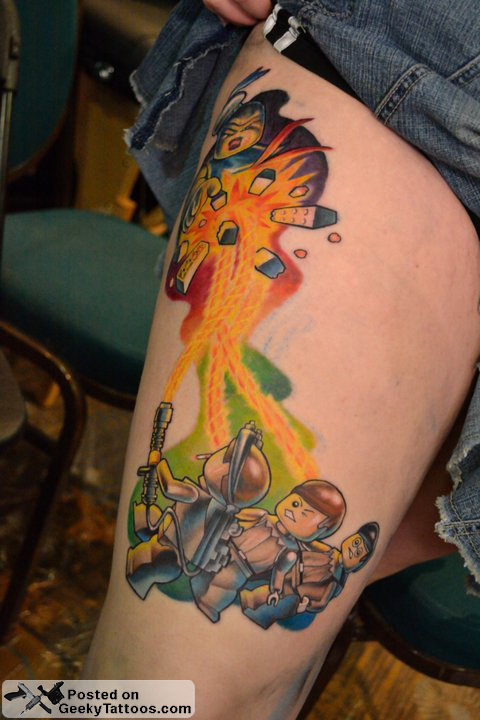 Well Daniel‘s wife, Tiffany, took the two geeky pleasures and combined them into a fun and colorful tattoo. I especially like the attention to detail with Venkman’s cigarette dangling. Heather Maranda of Skinfinity Tattoo in Winter Haven Florida is responsible for the inking. Tagged with Ghostbusters, Heather Maranda, leg, Lego, Skinfinity Tatoo.